Preparing turkey breast can be tricky: If you aren't careful, the meat can be dry, in which case it won't matter how much gravy you pour on it. Baking the meat slowly, however, locks in the moisture, making it juicy, tender and succulent. You can place the stuffing underneath the breast, where it cooks beautifully, crisping along the edges. This recipe is perfect for any festive gathering. Heat the oil in a skillet over medium heat. Add the leeks and sauté until very soft (about 5 minutes). Add the mushrooms and garlic and sauté 2 minutes longer or until the mushrooms are tender. Stir in the spinach and cook for 2 minutes, or until wilted. Add the stock and then stir in the spices, breadcrumbs, orange rind and cranberries. Season with salt and pepper. Let cool to room temperature. Stir in the egg. Combine the melted butter with garlic and herbs and brush over the breast and underneath the skin if possible. Bake for 15 minutes or until the skin starts to crisp. Reduce the heat to 300 F and bake for another 70 to 90 minutes or until juices are clear. A temperature of 155 to 160 F on an instant-read thermometer is perfect, as the temperature rises at least 5 more degrees as the turkey rests. Transfer the turkey to a carving tray, let rest for 10 minutes and transfer the stuffing to a bowl. For the gravy, drain the fat from the roasting pan, but keep all the browned bits. Place the pan over medium heat. Add the wine. Bring it to a boil, then reduce until 1 tablespoon remains. Add the stock and red currant jelly and simmer vigorously for 4 to 5 minutes to combine the flavours. The sauce will thicken slightly. If it is not thick enough, swirl in a mixture of 1 tablespoon of cornstarch and 1 tablespoon of water and bring it to boil. 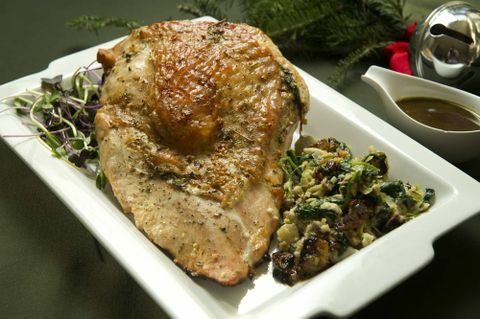 Serve with red cabbage, Brussels sprouts, green beans and roasted fingerling potatoes. See the original recipe at the Globe and Mail here.